Sometimes you spend hours waiting for a specific photo, anticipating and watching for the decisive moment in sweltering heat...other times you just stumble into the right spot at the right time. I wish I could wax lyrical about the planning and preparation that went into capturing this moment, but I can't. It was a combination of right time/place and luck (we all need some luck in this thing called wildlife photography!). 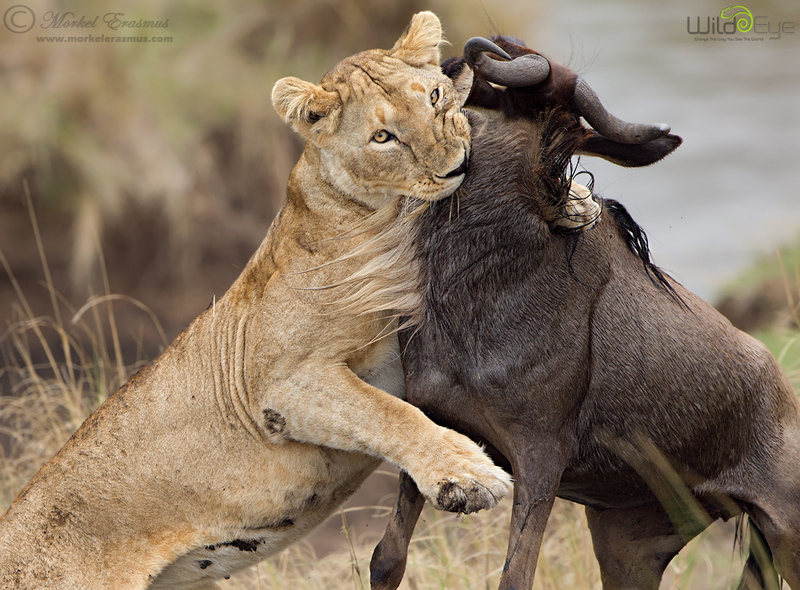 During our 2013 +Wild Eye Great Migration photo safari I hosted with +Marlon du Toit, we saw some lions lying in the grass next to the Mara river, and decided to head closer for some portrait photography. As we pulled to a stop, to our amazement a lone wildebeest scrambled up the riverbank (having just done a solo crossing we couldn't see from our vantage point), and the poor thing literally almost tripped over the lions. The largest female of the small pride wasted no time in pouncing on the unfortunate ungulate, and a lengthy struggle ensued during which we were privy to the emotional dance of death between these species that occurs during the Great Migration. This particular wildebeest didn't seem to want to give up and kept struggling to escape his attackers, but to no avail. We were very close to the action, and shooting with a 500mm lens forced me to compose a little out-of-the-box, but I liked how it came out! I also converted it to monochrome, and I like it better in that medium. What do you think?? Let me know which you prefer by dropping a comment below. If you would like to join us in the Mara Triangle this year for an awesome photographic adventure, then check out THIS page. Great shot - both images are impressive. I prefer the monochrome because it accentuates the lion's eyes.